college pranks and hijinks. or, this blog is not all about books (yet). When I tell recent acquaintances that I used to pull elaborate pranks in college (undergrad, claro), the universal reaction is disbelief. Maybe I’ve cultivated too much of a ‘nice person’ image. They can’t imagine that I'm capable of plans nefarious and/or crazy schemes. 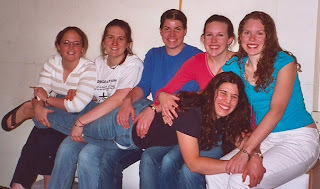 But let me assure you, weird and wonderful adventures were plotted and enacted in my college days. With frightening regularity, too. I have witnesses. Okay, so I was mostly a casual and occasional assistant in the mad plans, but I did take part when I wasn’t at swim or water polo practice. I had to! What else did we have to do with our spare time during freshman year? [That's a rhetorical question. I went to a small, religious college in a dry county in rural Western PA.] Or any year for that matter, but being young, impressionable things living together that first year, with clear targets in mind (freshmen boys! ), was like an extra incentive. Some of the stuff my girlfriends and I pulled off was truly inspirational. Like the time we took one shoe from every pair in every room on an entire boys’ hall and hid them all over that floor. Different rooms for every shoe. This was on a Saturday night, too, and we made extra sure to ‘misplace’ all of the dress shoes (in case their owners wanted to wear them to church the next day). Or when we lured another friend (an RA) out of his room, emptied his underwear drawer, and filled it back up with thongs from the Dollar Store. He got his boxers back days later. That was his birthday surprise. Did I mention the Kool-Aid in the showerhead yet? That worked for a while, and freaked the guys out (we used red raspberry, which looks surprisingly like watered-down blood). OHHH…and one year we got these Crayola ‘bath crayons.’ They’re for kids, and they’re supposed to turn the water pretty colors. Well, you ask to use a toilet in the men's dorm, and leave a RED pellet in the bowl along with some suspiciously wadded toilet paper, and I ask you, what do you think they assume? Completely harmless and scent-free prank, and proven to cause mass hysteria. And I actually wasn’t in on plotting this one, but I was there to see the results: for another RA’s birthday they removed his mattress, lined the bed with plastic, filled it with water (a good 3 inches deep, mind you), and had pet store goldfish swimming in it by the time he got back. And this is not counting the run-of-the-mill type pranks, like completely filling dorm rooms with balloons, or stealing shower curtains while someone’s in the bath, or absconding with all towels and clothing during the roommate’s shower. And let’s just say that there were a couple of epic pranks that we pulled during sorority initiation, too. Of course, my friends pulled the prank of all pranks on me, as well. Before you ask, I deserved it. Freshman year I bonded really fast with my girlfriends, and we were thick as thieves within the first few weeks. This was awesome, and also made for some weird episodes as you learned peoples’ quirks little by little. Set-up: I knew there was this guy my roommate had been eyeing for a week or two. I was on speaking terms with him (meaning I said ‘oh hi’ when we passed in the corridor). So I opened my big and ill-advised mouth one night after dinner and called him over to meet my blushing (tomato red, folks) friend. She stuttered out a super-awkward sentence or two, and I can’t explain to you how painful it was to see it unfold (not to mention excruciatingly embarrassing for my roommate and the guy). If I had had an ounce of sense in my head at that moment, I wouldn’t have done it. Unfortunately, I’m missing the filter between mind and mouth. Anyway, roomie wasn’t about to let me forget that fiasco anytime soon. The whole thing. Frame, mattress, pillow, covers, everything. Gone. I slowly turned to face my roommate, who was at her desk. Me: “Wha…Where’s my bed?” Thoughts started to filter in through the haze of exhaustion. Like, ‘What the heck is going on?’ And, ‘She must know what’s going on.’ Her: “Oh, I don’t know. Maybe you should look in the hall.” Me: “Huh?” I turned around and walked back into the hall, on the off chance that I’d missed my bed on that first visual survey. Nothing. The door was shut and locked behind me. I started to get that this was serious, that I was dead beat in the hall, that my roommate had something to do with it. I've never claimed to be quick, but this was a bit dense even for me, I know. As soon as I figured out the basics, though, I yelled questions (and maybe a little wrath) through the door. I was told to look on the little message whiteboard for “instructions.” I did this, after first going to the adjacent rooms and checking to see if my bed was hanging out at our neighbors’. The note was embellished with smiley faces and directed me to the third floor, such-and-such a room, and a promise for more info there. an immaculately-made BED (it looked glorious! ), turned-down covers and all, mint on the pillow, squeezed into that closet so tightly that I have never been able to comprehend then or since how they managed to fit it in. Everyone shouted “Surprise!” as I opened the door, and the sight of all that effort, just the plain craziness of it, prompted a grudging smile from me. I had to acknowledge the genius of it, even as I tried not to lose the tenuous hold I had on my temper. Shortly thereafter someone finally noticed that I looked haggard. It only took a few seconds for it to sink in that I was really grumpy because I was on the edge of collapse, not that I hated them for all eternity. Okay, there was a smidgen of that too (which I got over pretty fast). They got my bed back into my room with minimal help from me, and I was asleep within the hour. And after a couple of months, I could really laugh with appreciation whenever the story was mentioned. I mean, it was good. My annoyance actually heightened the effect of the prank overall. But my “death stare [of exhaustion]” worked like a charm, so no one ever dared play a prank on me again. I don’t think I (or they) would have survived the experience! So there’s your proof. I had too much free time on my hands in college and did silly things. Life was good. hilarious - lol. my college life was sooo tame in comparison. This was so fun to read! I loved it!